We were approached with a unique challenge to float a car on water (well at least to give the illusion that the car was floating). The project was for the BBC Gardener’s World Live Exhibition held at the NEC in Birmingham. 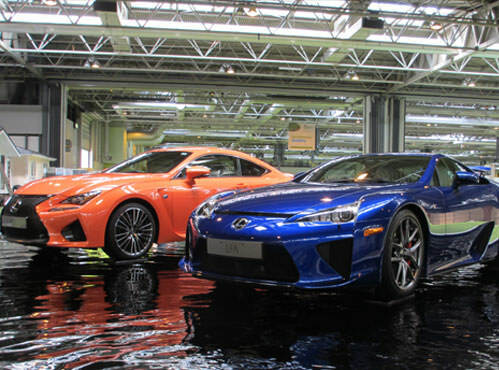 Lexus were the title sponsor of the event and they wanted to showcase their cars in a design which incorporated their national heritage by creating a Japanese Zen Garden with a pond. The project team wanted to float two supercars in the middle of pond as a showpiece at the event. The design of the feature was very large – it required a 10m diameter fountain in order to fit both cars. Where possible we will always trail our Bespoke Water Special Effects before they go live, but on this occasion it was not possible as our warehouse was not big enough to house the fountain, and we din’t have access to the cars. Our team had to plan carefully but rely on being able to complete the job on the day at the first attempt. They started by laying out the huge liner as the base and positioned the car first. The team would then build the tank around the cars and then finally fill it with water. The Lexus cars were then driven in and positioned carefully on black blocks. The tank surround was then assembled and the water added, along with a little dye to help mask the blocks. The water was filled just to the base of the tyre, so the block was no longer visible – creating the illusion that the car was floating. Stones and trees were then added to finish the pond creation and the cars were admired by visitors across the weekends event.